This DukeEngage group spends six weeks working with organizations in Durham, NC, then travels to sister city Durham, UK, for four weeks of work alongside similar organizations in a European community. An article about their contributions, titled “Charities get help from Durham, USA” ran in The Northern Echo, 8/4/18. 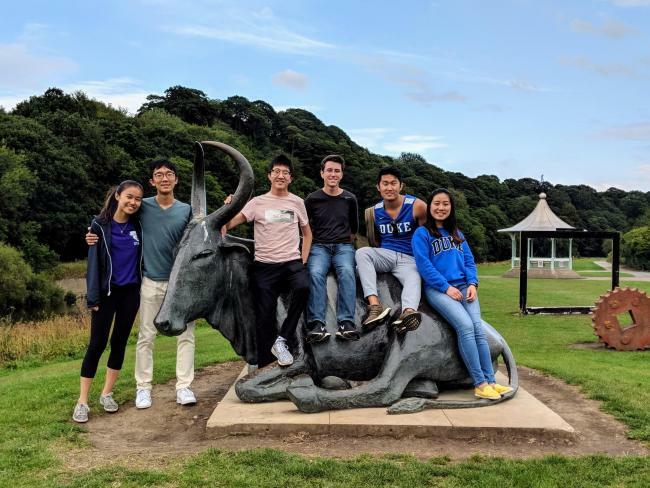 Six students from Duke University, in Durham, US, have spent four weeks in the North-East as part of a civic engagement programme. Among them were Harry Han and Sean Cho, who were based at Changing Lives, in Chester-le-Street, and Alex Heap, who spent time at the Waddington Street Centre, an independent mental health resource centre in Durham.